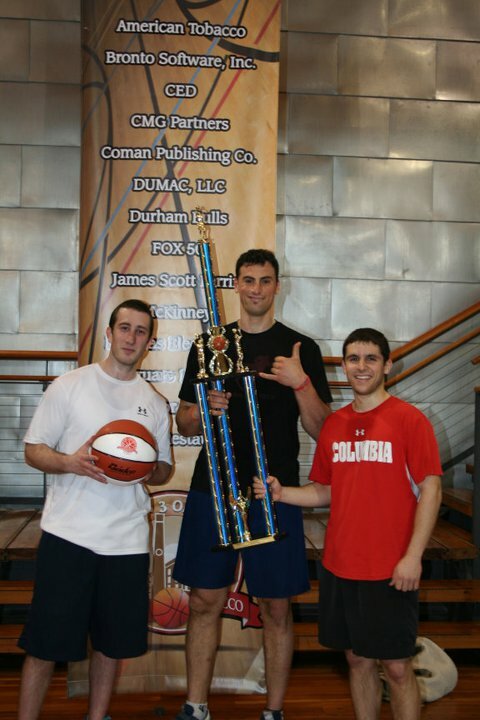 American Tobacco Campus hosted an awesome 3 on 3 charity basketball tournament in Bay 7 last Friday. The “Hoop It Up” tournament featured a 16 team bracket composed of American Tobacco Campus tenants. The makeshift indoor court had all of the bells and whistles of a real stadium: high ceilings, wood floors, food, drinks, jerseys, and even referees. ATC also included a giant projection screen TV, which broadcasted ESPN throughout the tournament, and a basketball moon bounce for the kids. 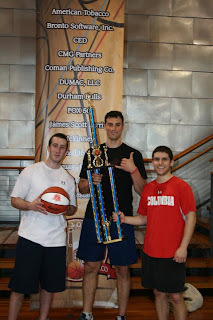 The team, comprised of Zach Strom - CED (on the left), Ari Zandman-Zeman - Bull City Forward & Rubberbanditz (in the middle), and Danny Olinsky - Argyle Social (on the right) battled through the fierce competition to a tournament championship. The trophy, which casts a shadow upon us all, is now hosted in the CED office. CED, Bull City Forward, and Argyle Social are working out a deal to keep the trophy in constant rotation between the three offices – stay tuned.